Small mobile robot for learning about sensing technology, microcomputers and AI. Contains glossary, basic knowledge, and instruction manual. Since it is pre-assembled, possible to develop as soon as the power is turned on. Positioning estimation is possible with 3 acceleration axis and 3 gyro axis. Featuring step-by-step learning from the basics of programming to maze analysis algorithms. Compact, lightweight, easy to carry and space-saving for development. Possible to control speed of robot through two small encoders. The HM-StarterKit is a palm-sized independent two-wheel mobile robot with many sensors. It offers higher performance than Pi:Co Classic3 and permits development in a smaller space. 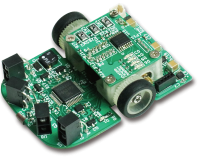 Using the unit, it is possible to learn the basics of wheeled robots, such as motor control, sensor sensing and odometry. The maze analysis algorithm utilizing the sensor and motor is designed to learn the real world application of artificial intelligence. *Specifications and prices are subject to change without notice due to improvement or other circumstances. HM-StarterKit manual.Only Japanese manual is provided.